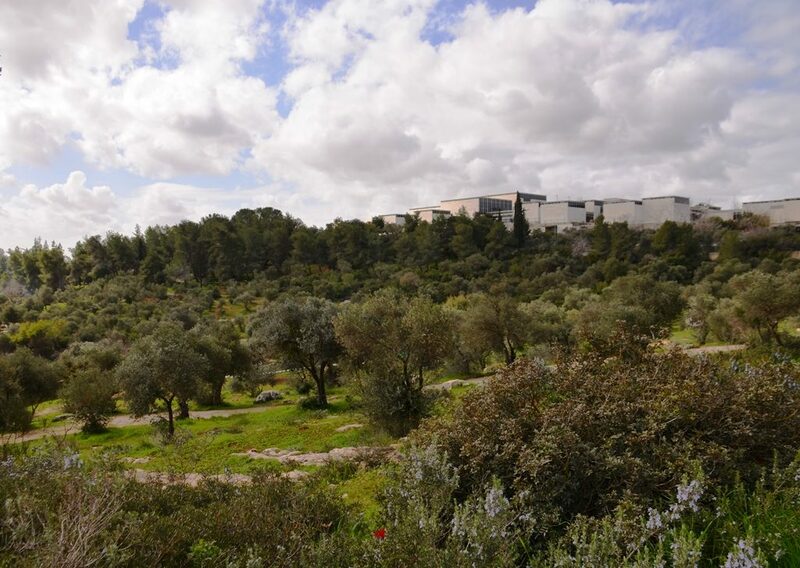 open spaces like this one under the Israel Museum turn green. 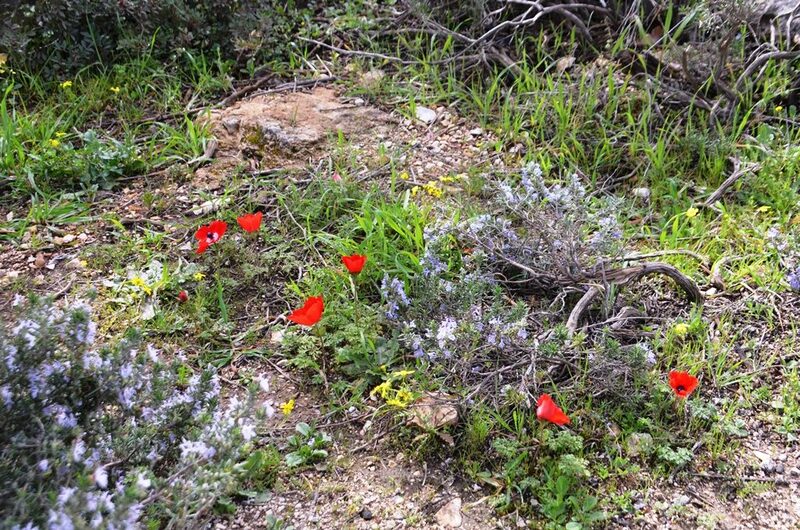 and see those red flowers that open up in the sunshine. 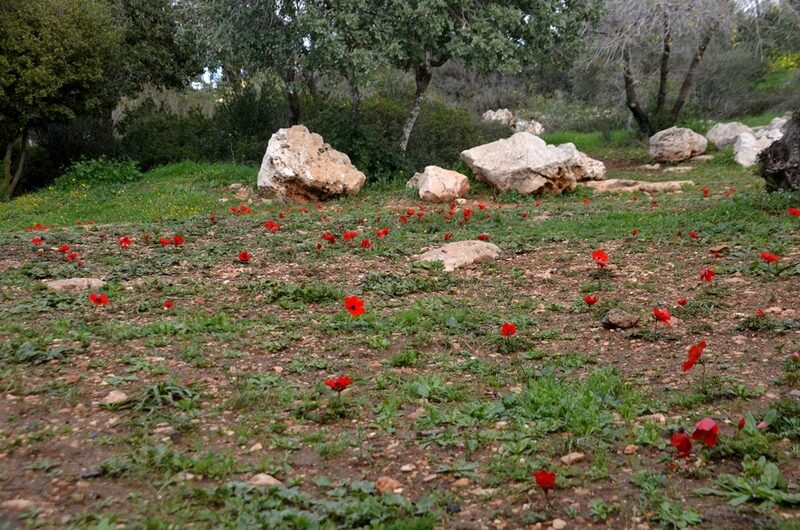 As the wild flowers peek through the rocks and weeds, often I am alone walking up the hill towards the Israel Museum and the Knesset. However, last Friday morning, nursery children were having a pre-Shabbat party with their parents. 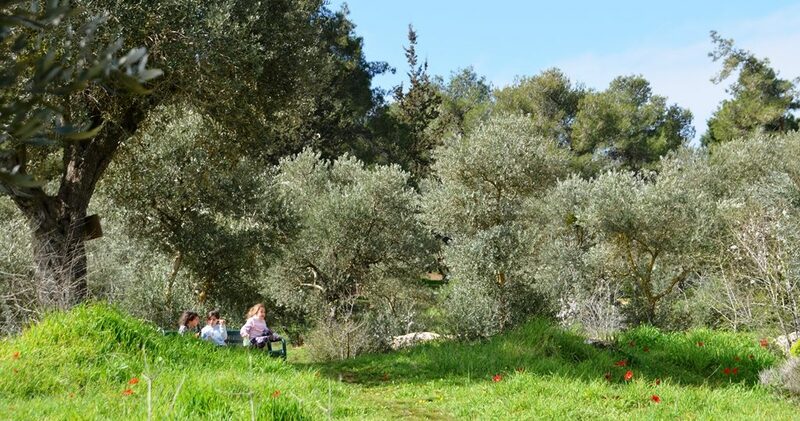 School children were also appreciating the wonders of spring. 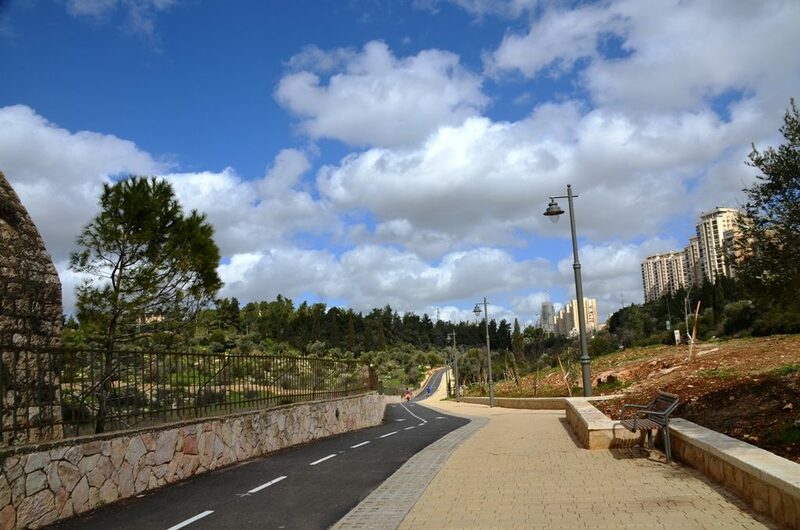 this new walking and cycling path that will lead to the Jerusalem Marathon finish line. 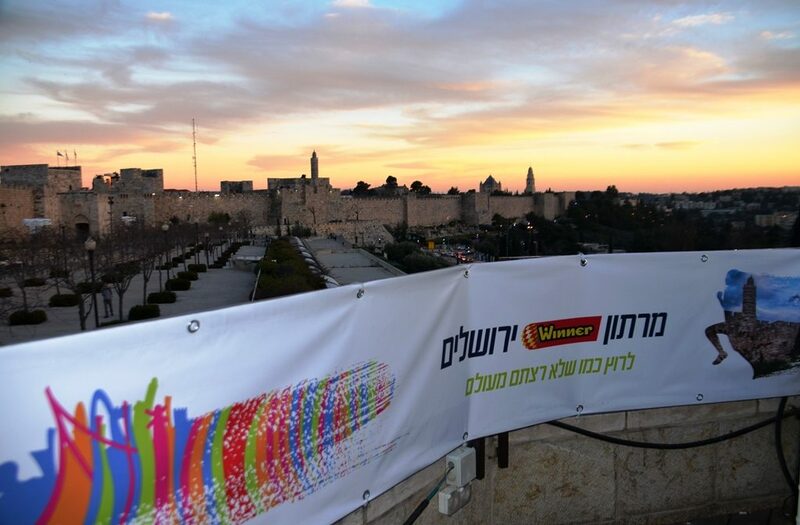 The Jerusalem Winner Marathon to be held on March 15, 2019 was launched last night by new Mayor Moshe Lion. 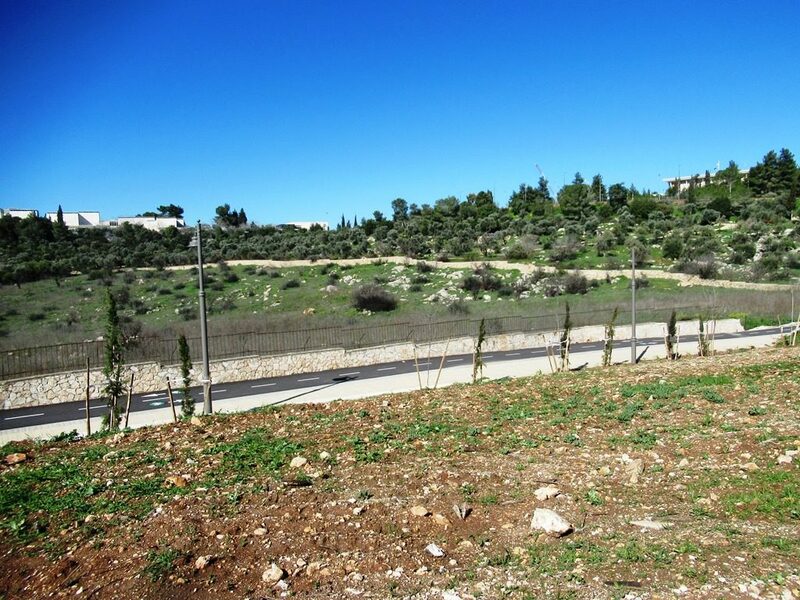 The full marathon runners, with the Knesset in the not so far distance, at this point will be near the finish line. 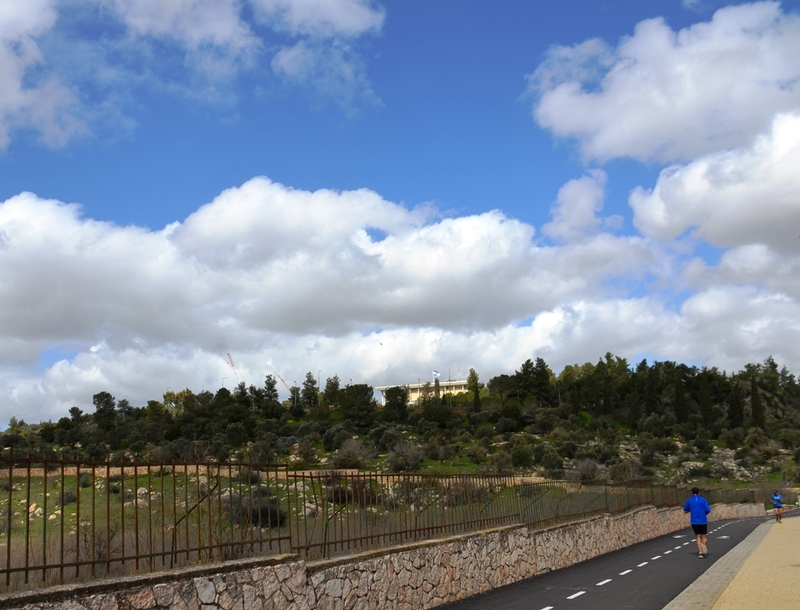 The new path is ready for the full Jerusalem Marathon runners before they enter the Gan Sacher, Sacher Park. There will be many more vantage points this year, as old and burnt areas have been cleared. 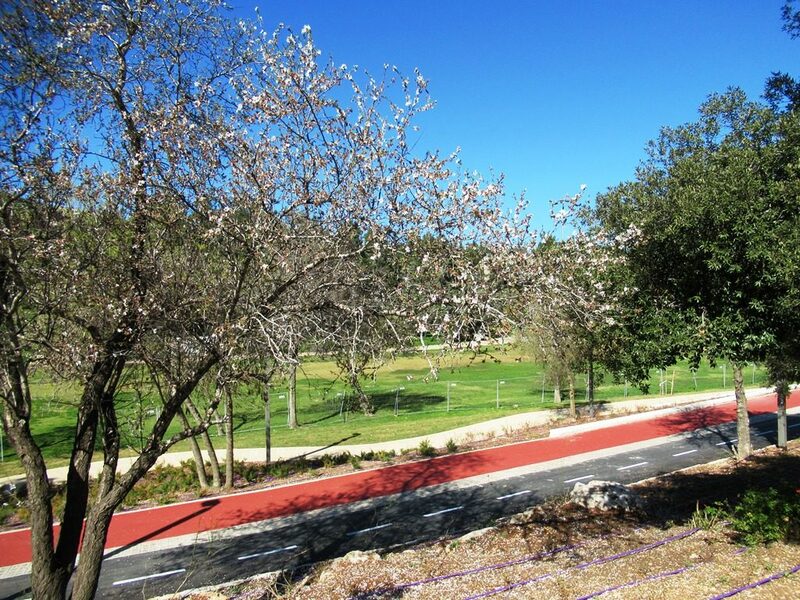 New benches have been placed along the cycling, walking and running path for spectators. After months of work, Gan Sacher looks like it will be ready before the start countdown. 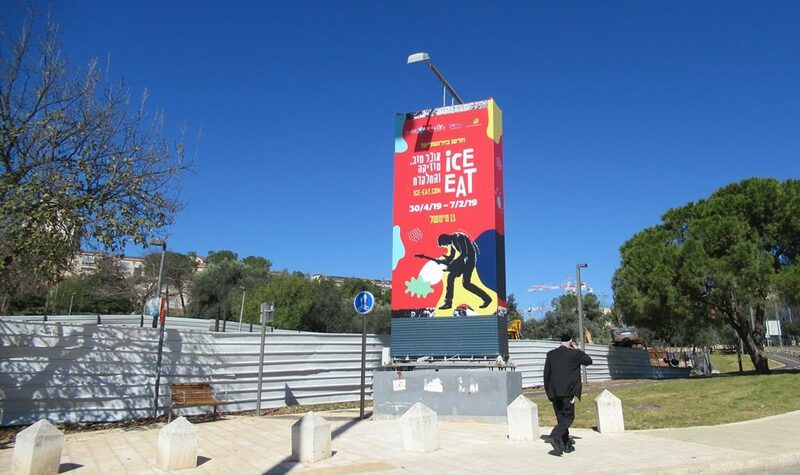 Posted across from Gan Sacher, is this large ad for the ice skating rink and food in Mitchell Park. 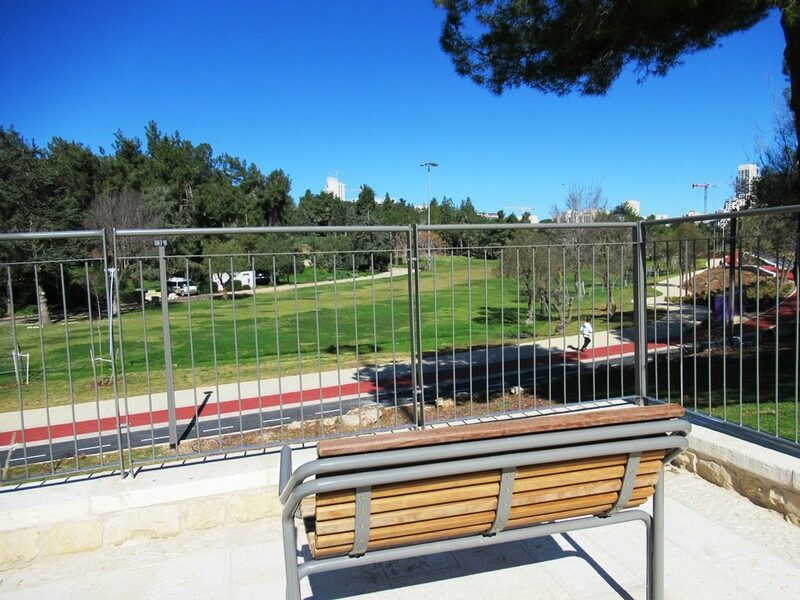 The Jerusalem Marathon is in its ninth year, but there is a new location for the ice skating rink. 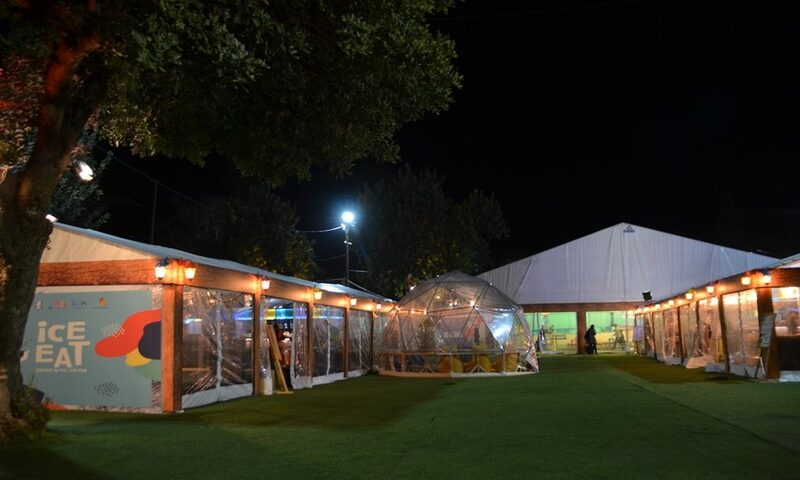 There have been previous ice skating rinks in Jerusalem, but this one seems to be the largest, with a new concept of ice and eat in Mitchell Park, which is near the Artists’ Colony. 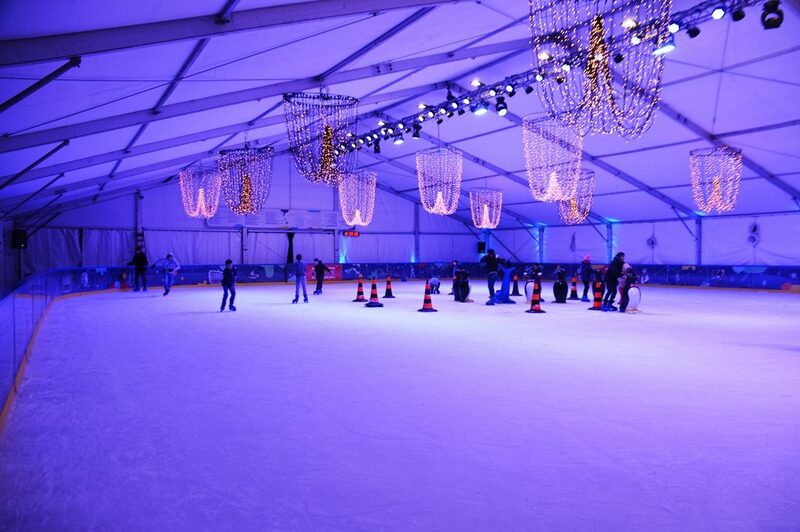 Not many people were eating or skating last night. No one was smoking last night when we went to check it out. And finally cycling. GFNY is set for May 3, 2019, and the registration sale ends at the end of February, but these cyclists were out training already. 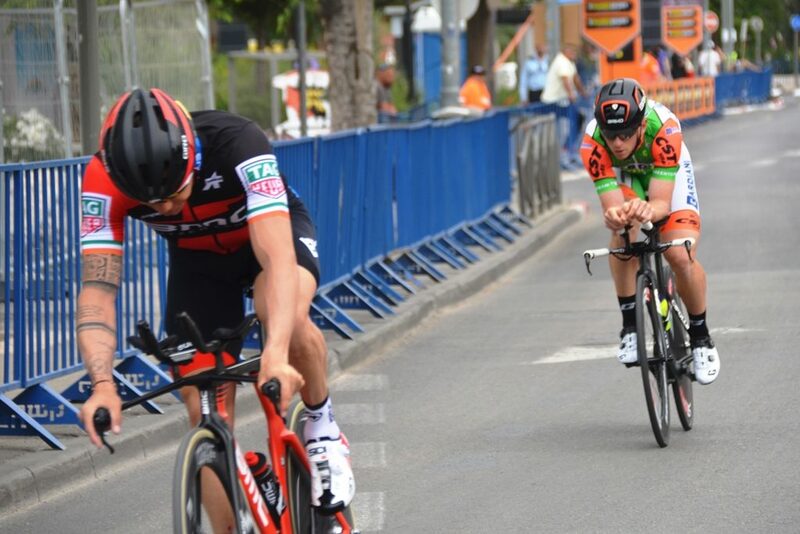 Another chance for amateur cyclists to ride with the pros. 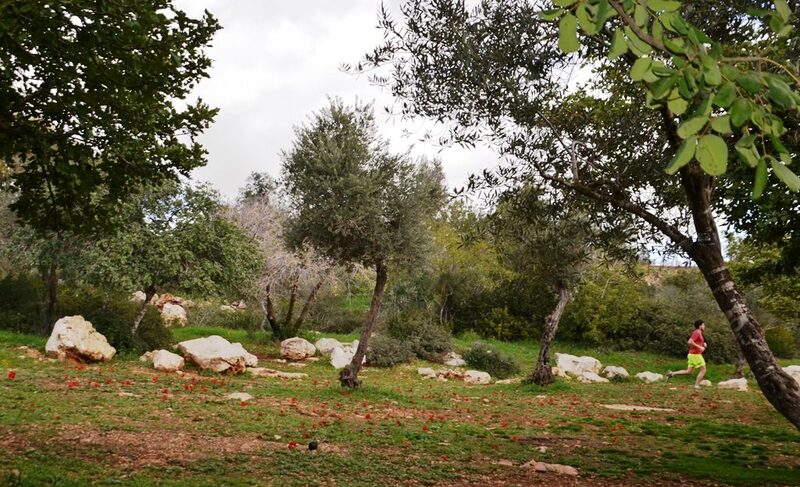 Jerusalem is not usually associated with sports, but walk, run, ride, or skate, or sit and eat. Always something new happening on these Jerusalem streets. 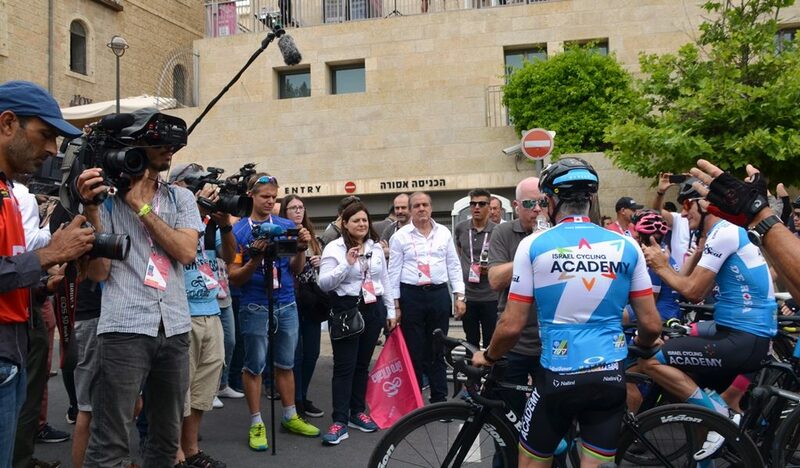 As predicted, the Giro d’Italia took over the Jerusalem, Israel streets. The information book was big and heavy. The press passes required ID photos. 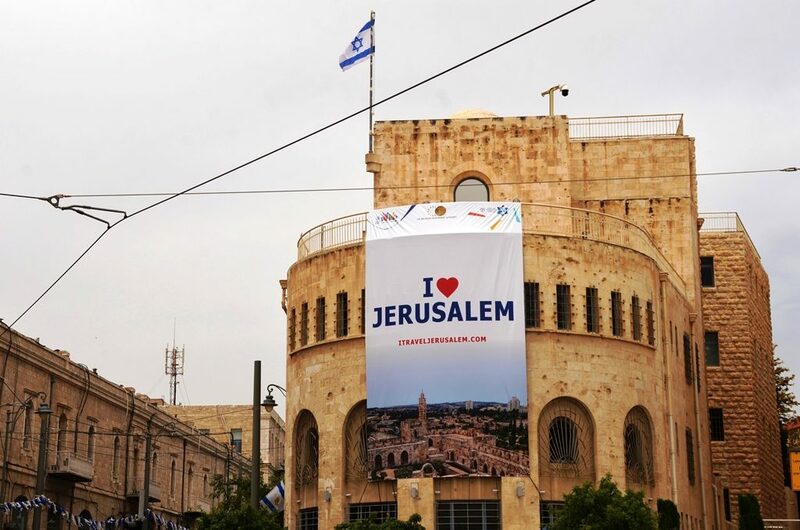 The ‘I love Jerusalem’ sign near the finish line was big, the biggest I have seen. 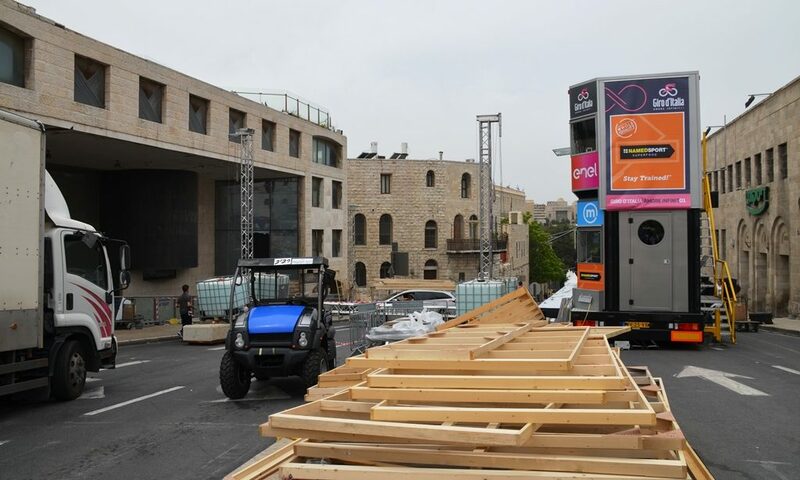 Streets were closed on Thursday to construct the start and finish lines, and the spectator boxes near Mamilla Mall and the Old City. Thousands of people came to support and report on the 176 riders of 22 participating international teams. Italian- speaking tour guides were in demand, but English was also the main language. I met two riders from the Bahrain team who were window shopping in Mamilla Mall. 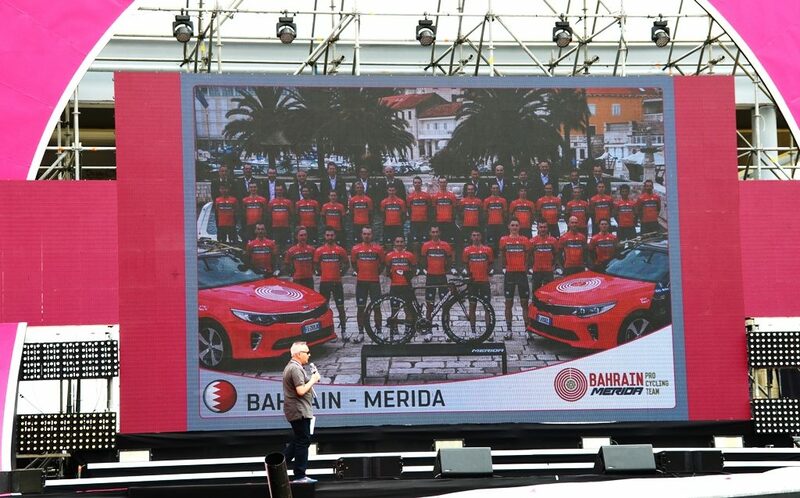 Bahrain was one of two Arab countries which sponsored cycling teams. 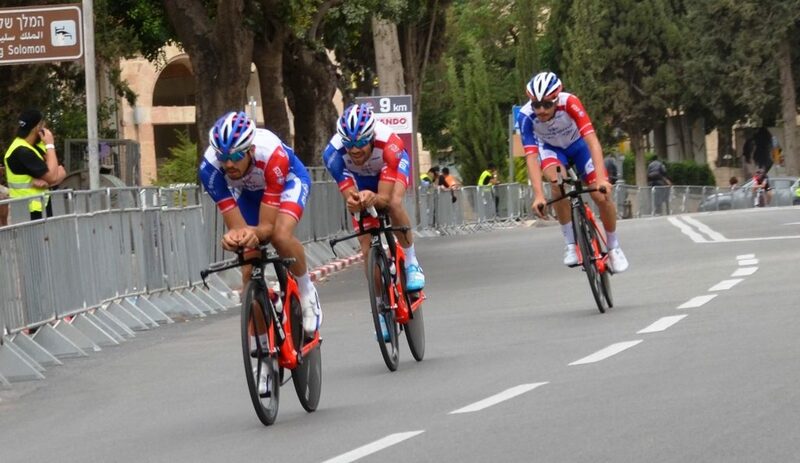 UAE, United Arab Emirates, also had a team of riders in Israel. 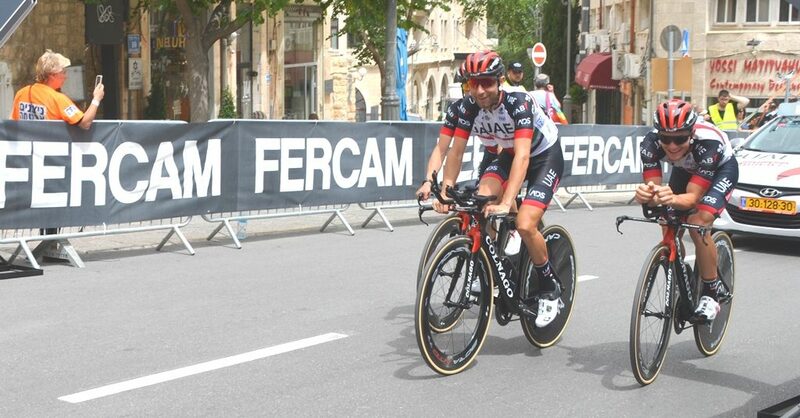 as riders were not flying by as quickly as they were for individual time trials held all afternoon. Teams could be seen pacing their turns together. At the finish line, crowds came early to get a good spot. These big stands at the finish line hosted the VIP spectators on Friday. On Thursday, there were piles of building materials. Before the official time trials began, the media gathered for a special ride in memory of Italian cyclist hero Gino Bartali. 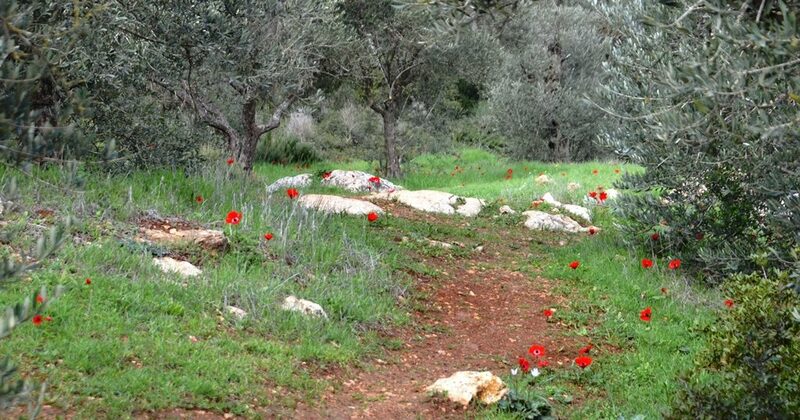 If you do not know his story, look HERE how he saved Jewish lives during the Holocaust. Oops, anyone can have a false start. 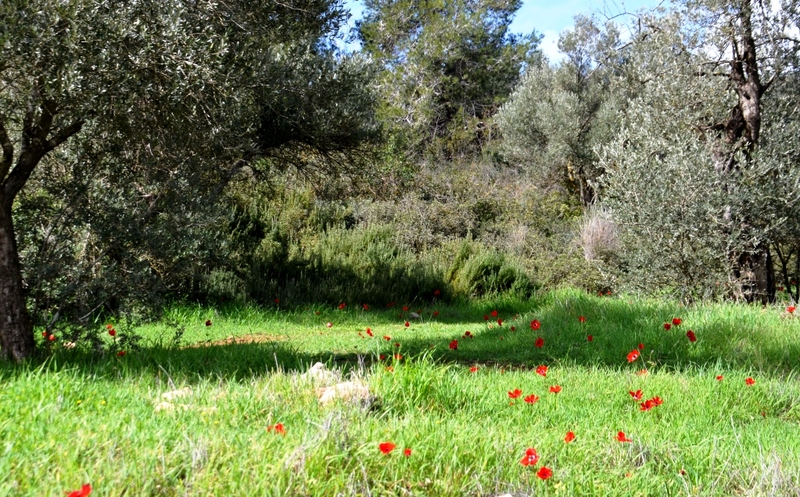 At a press conference before the Giro d’Italia began, cycling promoter Sylvan Adams told of his vision for Israel and Giro d’Italia. 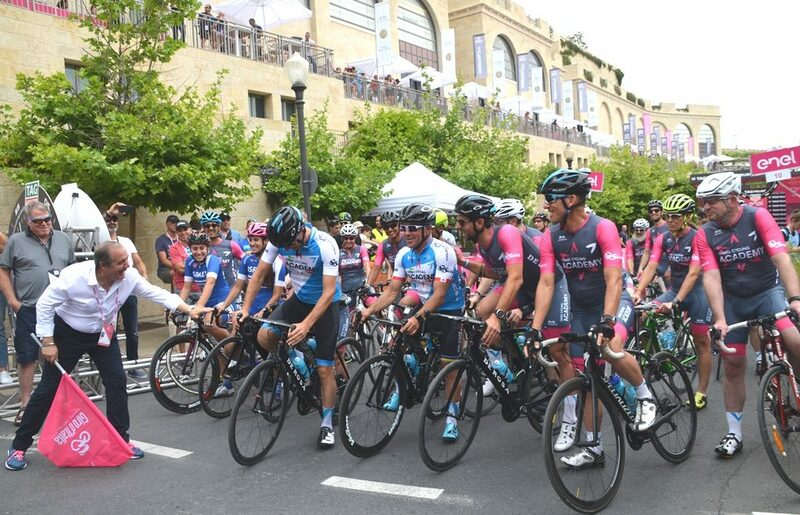 Israel Cycling Academy General Manager Ran Margaliot added his thanks to Adams for initiating and funding this first Giro d’Italia outside of Europe, while Guy Niv, one of the two Israeli cyclists, sat and listened closely. Helicopters flew over the riders with cameras to broadcast the race around the world. 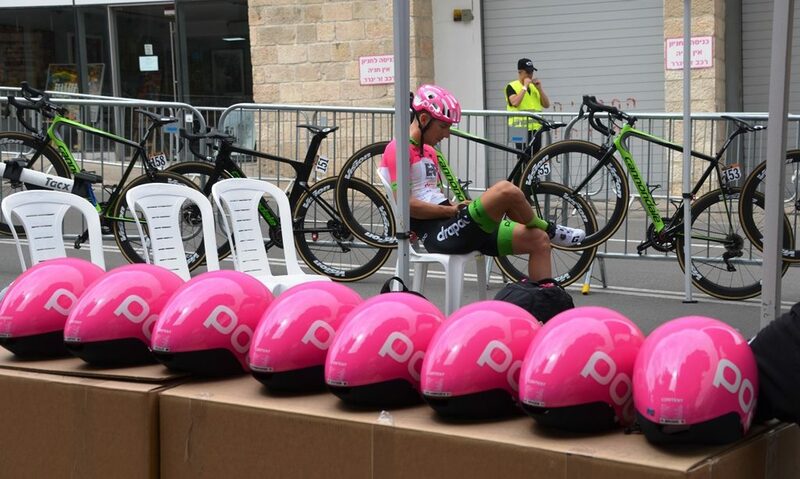 After Jerusalem, the Giro d’Italia went north for Stage 2, and then south from Beer Sheva to Eilat for Stage 3, Along the way Bedouin came out from their tents to watch. 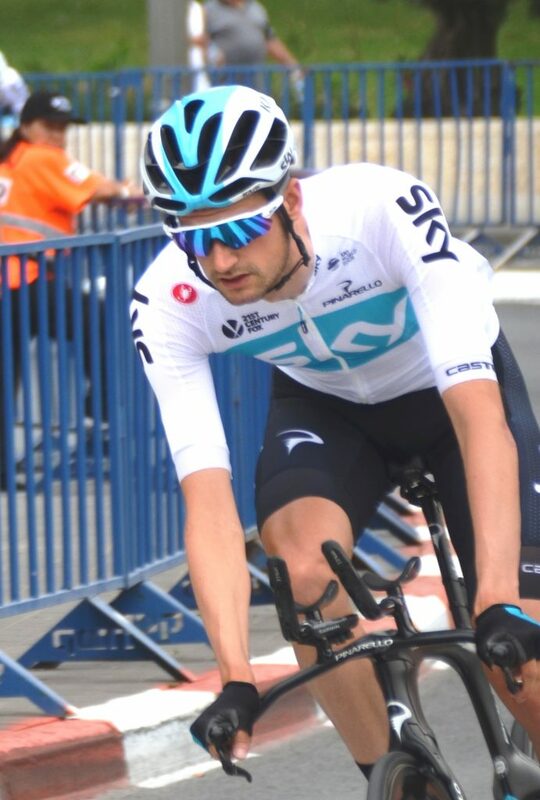 After the 229 kilometer ride through the desert Elia Viviani won the Stage 3, as well as the Stage 2 from Haifa-Tel Aviv. 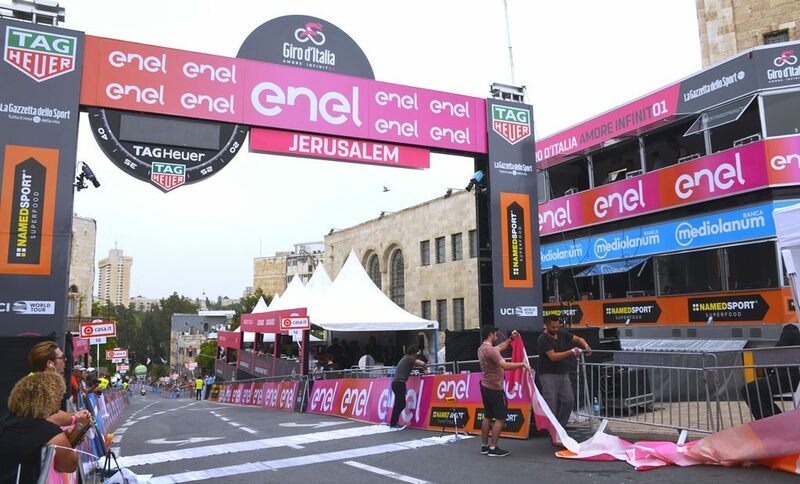 The big, pink Giro d’Italia took over the Jerusalem streets. 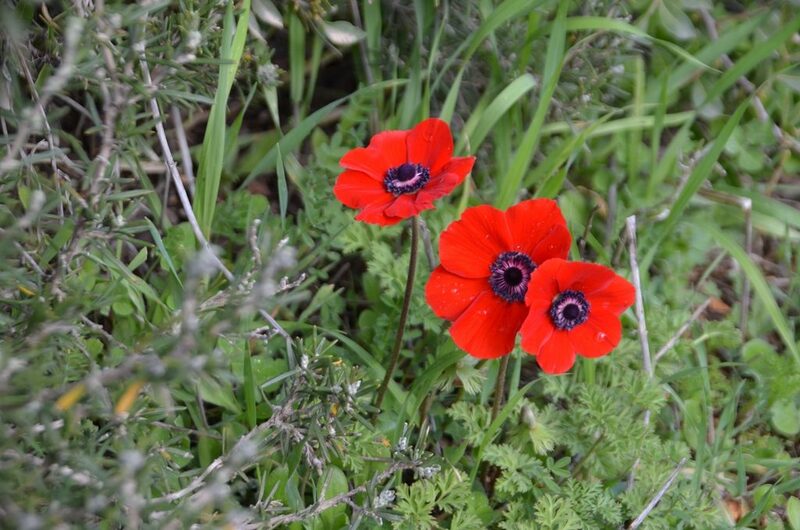 The cyclist from Bahrain explained the color to me. 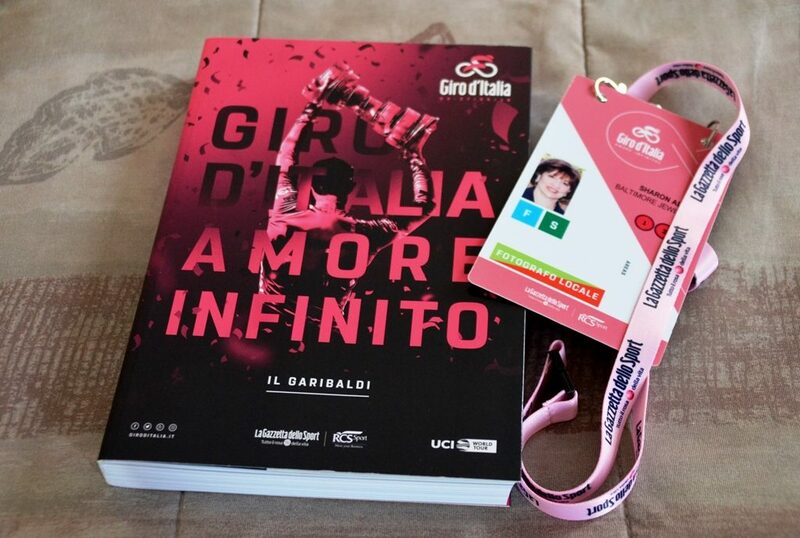 The Italian sports paper from over 100 years ago when the Giro d’Italia began, was printed on pink paper. 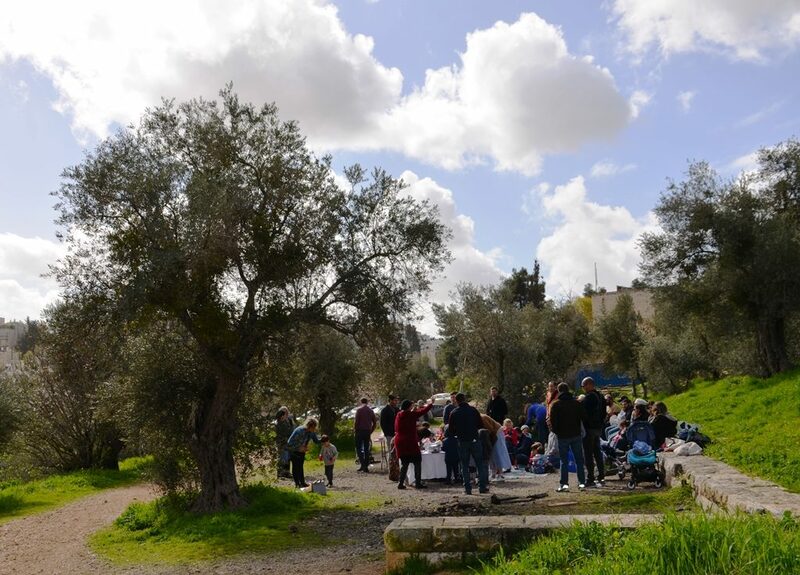 It was almost possible to overlook Lag B’Omer this year. In some neighborhoods the bonfires were fewer and smaller. 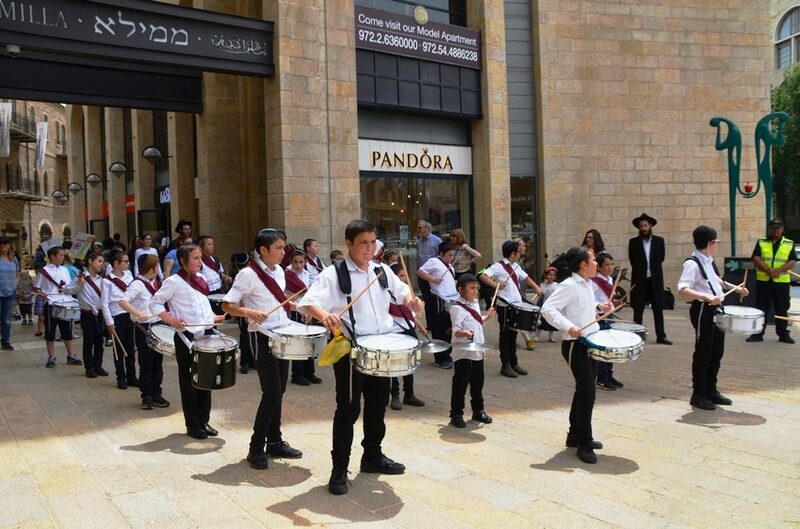 However, these boys leading a Lag B’Omer children’s parade from Mamilla Mall drummed loud enough to remind everyone. 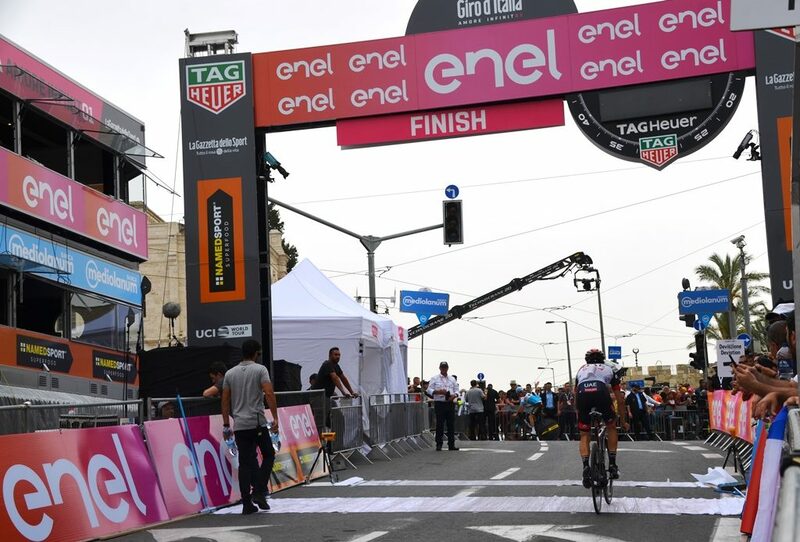 After an overnight stay in Eilat the Giro d’Italia has a three hour flight to Catania, for a rest and the next stage. The race ends in Rome on May 27, 2018. 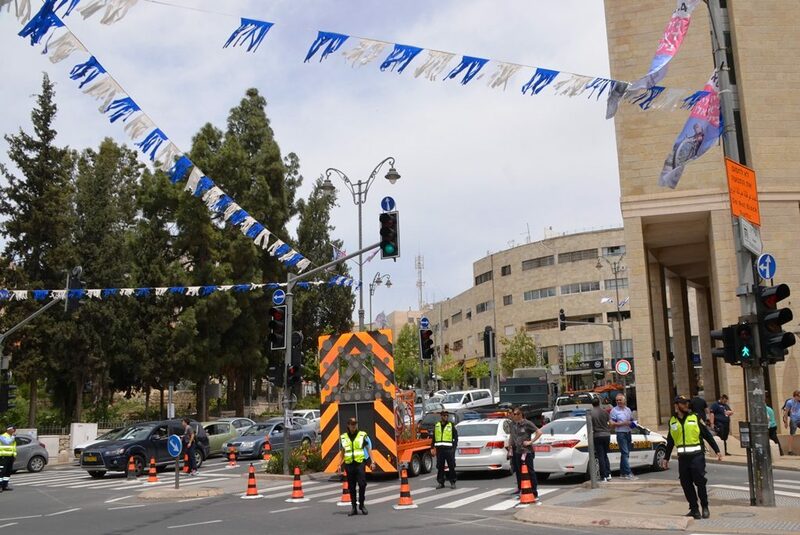 With the Giro d’Italia completed in Israel, streets in Jerusalem will go back to blue and white. 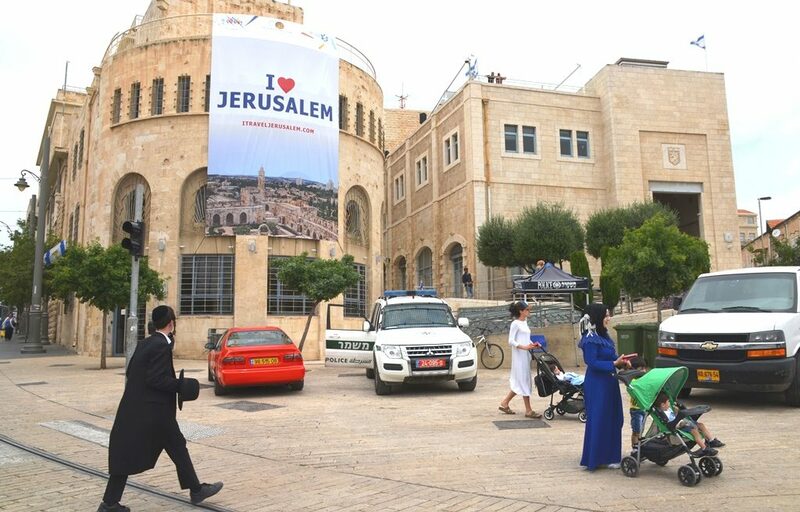 Preparations for Yom Yerushalayim, Jerusalem Day, are especially significant this year with announcement of US Embassy moving, and other embassies returning to Jerusalem. 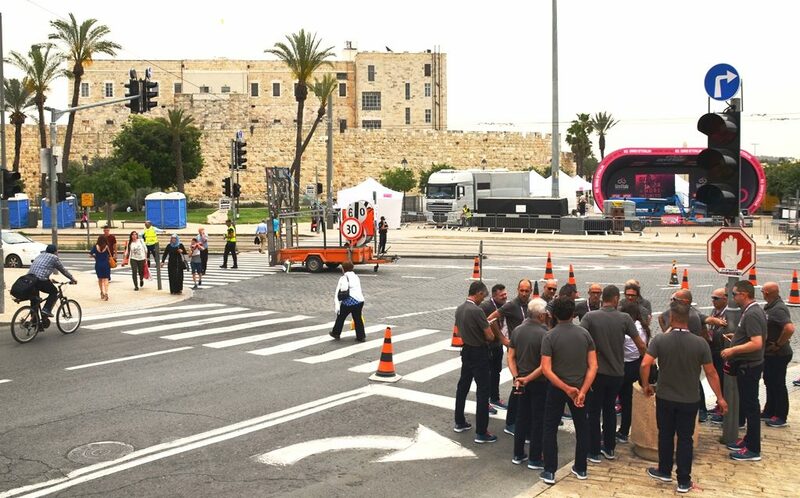 Giro d’Italia has taken over the Jerusalem, Israel streets. 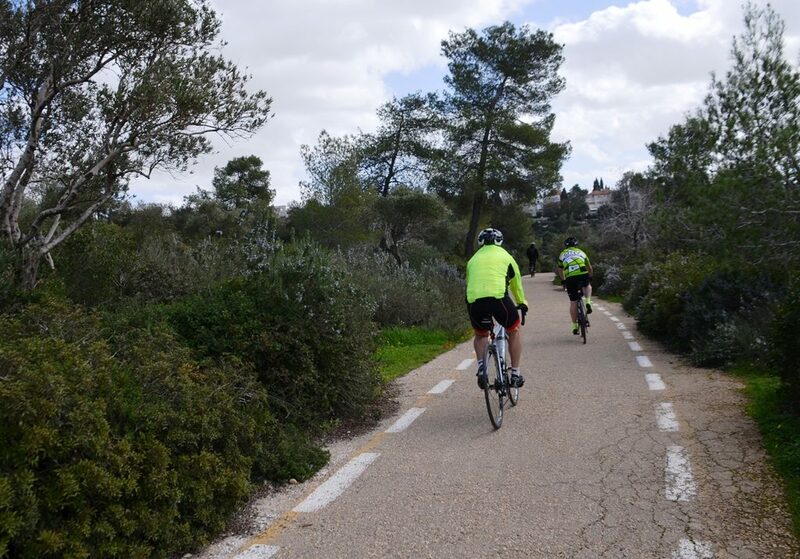 Thousands have come to Jerusalem, Israel, for the professional cycling event. A billion are to watch on live televised showing of the race. 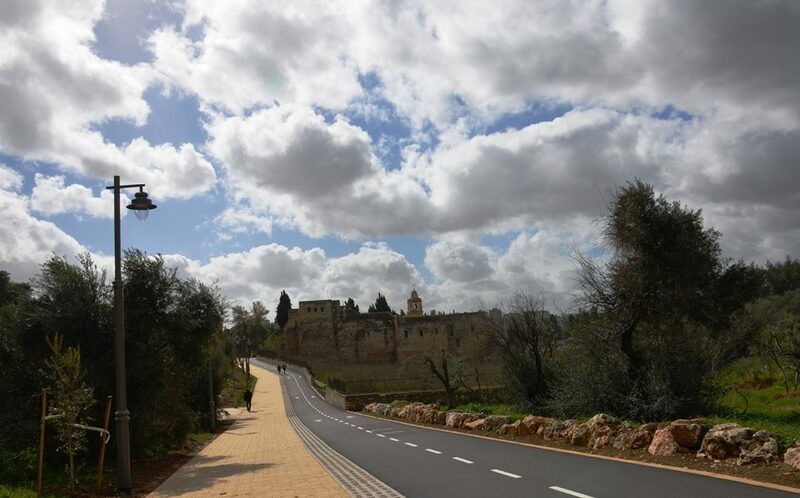 This ‘I love Jerusalem’ sign will show as cyclists reach the finish line.